Sideline Prep | Will My Age Prevent Me From Making the Cut? Will My Age Prevent Me From Making the Cut? Can I become a Pro-cheerleader or Pro-dancer at my age? Thousands of ladies dream of landing a spot on a team in the Pro-Cheerleading/Pro-Dance industry. However, some doubt their age… and then fail to audition all together or go into auditions feeling insecure about their age. That’s why I was glad I had the opportunity to discuss this very concern with a few of our Lovelies during the Pro Cheer Playbook Enrollment calls. Overwhelming, this topic of age kept coming up… and I could tell that these ladies were apprehensive about auditioning because they thought they were too young or too old. As women, we have so many insecurities… age being at the top of our list as we mature into adulthood. Bottom line… Sitting on the couch and watching everyone else live “YOUR” dream will not solve your problems, address your thoughts or answer your questions. Yes, I understand that you may have doubts about age, image, fitness and the list can go on. Let’s be honest, we all have doubts but we can’t let those doubts or fears prevent us from moving forward. The best way to know if you are too young or too young is to do your research! If you don’t research the proper information, you will never know “The Facts of Life” or in this industry… The Facts of Pro Cheerleading! I’m very interested in learning about your thoughts on this topic and your concerns! Have you had thoughts about your age and auditioning for a Pro Team? How did you or can you change those doubts so you can pursue your dreams? Sideline Prep Lovelies, please leave your comments below and let me know. Remember to share your story and advice below. 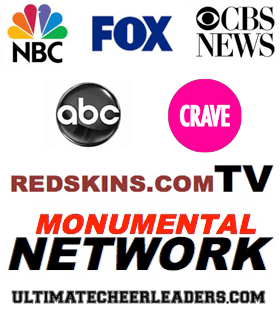 You never know when your story may encourage someone to audition for a Pro-Cheerleading/Pro-Dance Team! If you know anyone that has these doubts and would like to chase their dreams in this industry, share this advice! It could actually give them ammunition to audition for a Pro Team and give them an action plan on how they can take that next step onto a Pro Cheer/Dance Team.. Thank you so much for watching, reading, sharing and gracing me with your presence. Your voice is very important and I hope you enjoyed this blog! Thanks! This was a helpful video and I do hope it inspires others to go for it. I was an NBA dance team finalist at 32 so you never know. I thought I might be way way too old to reaudition at 35 but the coaches thought my dancing had actually improved and encouraged me to audition again. I didn’t make the team or get as far in the process this time but I certainly did not feel silly auditioning and am glad I went for it. Many good things come from preparing for auditions…I’ve become more fit, polished and confident. I think communicating with the coaches or other dancers can help a lot to let you know what you can work on/if you might be a good fit. GeNienne, you can probably speak to this more but from my understanding it can also depend a lot on who else is auditioning that year and how you look/dance compared to them…some years it’s a younger team, taller team, more technical team, etc. You might not really know what you’re up against until the day of the audition, which is part of the excitement. Good luck, and have fun, all!